A bit off-topic, but a visual treat for you for the weekend. 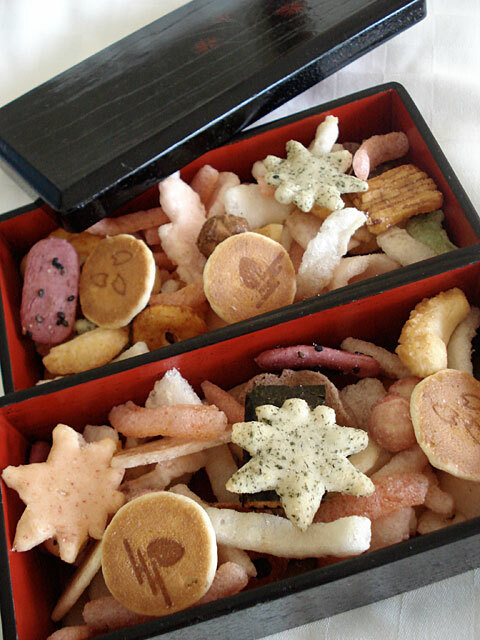 This is an assortment of delicate rice crackers from Kyoto, that my mother sent to me in her latest care package. They are mostly savory, but a few (like the brown flat ones that look like mini pancakes) are subtly sweet. I’ve arranged them in a hand lacquered two-tier wooden bento box. I’m contemplating whether I’m brave enough to pack a regular bento in there since it’s so beautiful! I think the blend of colors and textures is so beautiful and elegant without being at all garish. It really has a Kyoto aesthetic. 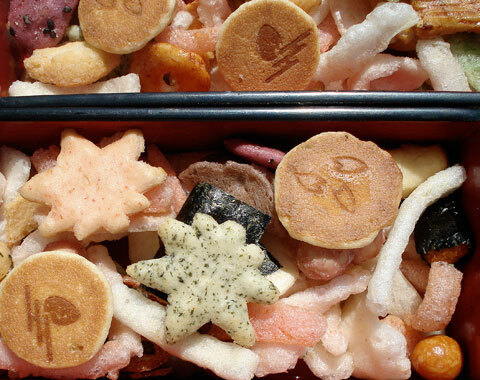 As I’ve said here a few times previously, I’m not really into cute charaben/kyaraben, but if I can manage to make my bento boxes as visually appealing as this humble assortment of rice crackers, I’d be very happy indeed.